More than 900 players have skated for the Rangers over the past 82 years, and many of them played in only one game before returning to the minors, never to resurface again. 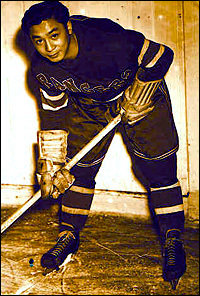 Larry Kwong became the first NHL player of Asian descent when he played his only game as a Ranger on March 13, 1948. So how is it that a particular player, who played all of one shift in his lone NHL game 60 years ago today, merits special attention, including acknowledgement of a milestone anniversary for his one-game NHL career? Well, for starters, Larry Kwong wasn't just any player. The center called up from the New York Rovers for a one-game stint against the Montreal Canadiens on March 13, 1948, made history that night as the first person of Asian ancestry to perform in the NHL. In promoting him to hockey's top league, the Rangers organization made history, too, breaking a racial barrier that had stood since the league began play in 1917. Consciously or not, the Rangers followed the lead of baseball's Brooklyn Dodgers, who had brought Jackie Robinson into the big leagues one year earlier. Coincidentally, Rangers general manager and head coach Frank Boucher would give Kwong his NHL shot in Montreal -- the same city where Robinson had begun his road to the Dodgers as a minor-leaguer. Kwong would play his only game for a Rangers team that barely qualified for the 1948 Stanley Cup playoffs against an even weaker team at the Montreal Forum. In March 1948, the Habs were on their way to a fifth-place finish in the six-team league -- marking the only year from 1941 to 1970 that Montreal did not go to the playoffs. However, they would go on to sweep the Rangers in this particular home-and-home series in mid-March of 1948. The game itself wasn't all that important. Montreal took a 1-0 lead on a goal by Bob Fillion in the first period and stretched that advantage to 2-0 when Hall of Famer Elmer Lach scored early in the third. The Blueshirts battled back to tie the score on third-period tallies from Edgar Laprade and Frank Eddolls, but Montreal pulled out the 3-2 victory when Ken Reardon scored with 3:35 remaining in the period. It was certainly an eventful third period, but not just because of all the goals scored. Midway through the period, Boucher tapped Kwong for his first and only NHL shift after having kept him on the bench for almost all of the game. In those days, players called up as injury replacements sometimes suited up without actually getting into the game. Kwong's moment on the ice was brief and fleeting -- not much longer than one minute -- but it was also historic and remains noteworthy 60 years later. Ten years after Kwong played his one shift, Willie O'Ree broke hockey's more famous racial barrier when he played for the Boston Bruins. While O'Ree's achievement remains one of the great, pioneering moments in the game's history, Kwong's brief glimpse of the spotlight also required a lifetime of persistence in a culture where Asians were often treated as second-class citizens. Born on June 17, 1923, Kwong was the son of a Chinese immigrants who ran a grocery store in Vernon, British Columbia. His father, who died when Kwong was a young boy, had come to Western Canada looking for gold and instead found a new life as a grocer -- the same business his son would go into after retiring from hockey. Passionate about Canada's favorite sport from a young age, Kwong starred in minor hockey but was rarely viewed as a potential NHLer for two reasons. He was only 5-foot-6 and 150 pounds. He was also Chinese-Canadian, which was hardly the typical background of a pro hockey player at the time. Kwong first began to draw notice playing in men's leagues in British Columbia during the World War II era, when NHL scouts had to look long and hard for talent. In 1945-46, Kwong scored 12 goals and 20 points for the Trail Smoke Eaters. That helped convince Rangers scouts that he was worth bringing to the New York Rovers, who also played at The Garden and served as a lower-level farm club for the Blueshirts. Seizing the opportunity to play in New York, Kwong registered 19 goals and 37 points in 47 games with the Rovers in 1946-47. In the process, he helped the team nicknamed the Red Shirts win its first Eastern Hockey League title since the pre-World War II era. Several members of Kwong's talented 1946-47 Rovers team would go on to play in the NHL, including future Rangers coach and general manager Fred Shero. For Kwong, however, the NHL still seemed very far away until late in the 1947-48 season when several Rangers players went down with injuries and the team needed emergency help for a game in Montreal. Two key players missing from the lineup were forwards Phil Watson (bruised left leg) and Neil Colville (groin). Yet another forward, Billy Taylor, was unavailable because only four days earlier he had been banned from the league for allegedly betting on an NHL game. At age 24, Kwong had been dominating with the Rovers that season and was averaging well over a point per game. This had already made him a popular figure among New York's Chinese community and his call-up to the NHL made headlines, particularly in Western Canada where he was already something of a folk hero. During his two years in New York, Kwong was known to most hockey fans as "King Kwong" -- a Rangers game program referred to him only by that name. Kwong was also tabbed with the nickname "The China Clipper" which would later become much more famous in Canada as the nickname of Canadian Football League star Normie Kwong, who went on to become a part-owner of the Calgary Flames. Kwong did not go to Montreal alone, since Rovers teammate Ronnie Rowe was also recalled on that day and made his NHL debut that night. Following the game at the Forum, Kwong was immediately returned to the Rovers, but Rowe remained with the parent club for four more games, including the Rangers-Habs rematch the following night at MSG. With the Rovers, Kwong wore No. 6, but some question remains as to the number Kwong wore during his lone NHL game with the Rangers. The team's official media guide lists him with No. 8, but in a 2001 article in the Toronto Globe and Mail, Canadian sports historian Tom Hawthorn, who had spoken with Kwong for the story, reported that he had wore No. 11 on March 13, 1948. If Kwong did wear the number that was later retired in Mark Messier's honor, he would share a special connection to Adam Graves, who wore No. 11 for just one road game, which also happened to be his Rangers debut. Graves, whose more familiar No. 9 will be retired next season, donned No. 11 for the Rangers' 1991-92 season-opener in Boston but gave it up when Messier joined the team. In the fall after his brief NHL career ended with one shift in Montreal, Kwong was back in that city's suburbs as a member of the Quebec Senior Hockey League's Valleyfield Braves, where he embraced a chance to play regularly. One of the regular opponents in his first season with the Braves was the New York Rovers. Even as Kwong left the Rangers organization, it became clear that his presence had made a difference in the team's culture. In 1948, the Blueshirts invited Herb Carnegie, considered the greatest black hockey player of his era, to training camp in Lake Placid. This time, Boucher was prepared to make an even bolder move in breaking the NHL's color barrier nearly 10 years before O'Ree joined the Bruins. Had Carnegie stayed with the team, he might now have O'Ree's place in history. Carnegie, however, turned down the Rangers' minor-league offer because it paid less than what he was could earn in Quebec. After his short but historic stay at the Rangers' camp, Carnegie returned to the QSHL, where both he and Kwong were among that league's top players. Kwong spent seven seasons with Valleyfield, leading the league with 51 assists in 1950-51 to win MVP honors. Kwong then moved on to another team in Trois-Rivieres before entering the IHL with the Troy Bruins and later wrapping up his career with a season in England at age 35. Remaining in Europe, Kwong worked as a hockey and tennis coach in Switzerland before returning to Canada to join his brother (one of more than a dozen siblings) in running a grocery store in Calgary. Now approaching his 85th birthday, Kwong still lives in Calgary, but has had medical problems that led to the amputation of both of his legs below the knees. The milestone anniversary of his historic NHL appearance today is something Rangers fans can look back on with pride, because the Blueshirts were ahead of their time in becoming the first team to put a person of Asian ancestry into an NHL game. In the 60 years since Kwong's debut, many others have followed. The list of current NHLers of Asian descent includes superstar Paul Kariya, Carolina defenseman David Tanabe, and Islanders forward Richard Park. Former NHLers include Steve Kariya, Jamie Storr and South Korean-born Jim Paek, who became the first person of Asian heritage to win the Stanley Cup with Pittsburgh in 1991. His career might have lasted for only a New York minute, but Larry Kwong's role in hockey history will never be forgotten.